San Bernardino Spirit batboy Dustin Avila had a job any kid would want. He was a batboy for the San Bernardino Spirit in 1988, according to The San Bernardino County Sun. Avila got to hang out with pro players from the local Mariners affiliate. He also got in position to get some pointers from those real life pro players, including a slider lesson that came a few years too early, according to The Sun. "It's fun," Avila told The Sun that June as he made a food run for the players. "You get to know a lot of the guys, a lot of famous people. "They treat me like one of the guys." 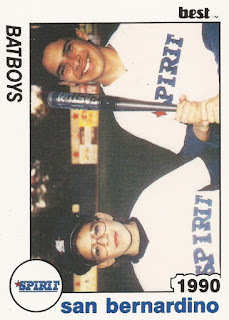 Avila was one of two batboys for the Spirit in 1988. The other was Rob Harvey Jr., the son of the Spirit's radio announcer, The Sun wrote. Avila and Harvey were the batboys for the Spirit in 1988. The Spirit's batboys in 1990? Well, they got a card. The two batboys for the 1990 got their photos on cardboard in the Best set, but their actual names were not included. Instead, they're identified simply by their job: "Batboys." The card back is no further help. The back is the team checklist.